Microsuction is an ear cleaning technique using a microscope and suction device. It is the same technique used by Ear, Nose and Throat specialists and is superior to other methods such as water syringing (higher risks of ear drum trauma and ear infections) and ear candling (limited evidence on effectiveness). Microsuction is safer, gentler, more effective, and does not require water or pre-visit ear wax softeners. 1. A disposable speculum (funnel) is inserted into the ear canal. 2. The doctor examines the ear canal and tympanic membrane (ear drum) under the microscope. 3. A camera can display the doctor’s view on a computer. 4. 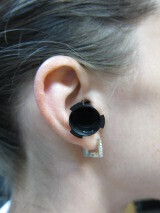 A suction tube is inserted into the ear canal. Any ear wax and debris is suctioned out under the microscope. Ear drops, probes and forceps may also be used. 5. The camera can be used again to show a clean ear.